Softin is a 501c3 nonprofit organization Our Mission: With funding from the public, SOFTIN enables the disabled, builds self-esteem in the physically and mentally impaired, helps victims of abuse overcome trauma, assists elderly in living fuller lives, educates children and teaches troubled youth the values of nature, conservation and community spirit... all through unique and tailored at-sea learning/research experiences. Last evening, SOFTIN along with our collaborative partner Child Abuse Listening & Mediation (CALM) and Capt. Jason Diamond the owner of the vessel, Stardust, provided a much-needed seagoing adventure for nearly forty battered/abused children and moms. These families live daily with abusive situations that seem like nightmares, so it gave us a powerful sense of accomplishment to give them an opportunity to learn, interact with nature and just have some good clean fun. The kids’ faced lit up when they came aboard and spread out around the beautiful vessel. All the sights and sounds were new and exciting and the kids went into “learn and have fun” mode in a supervised environment, allowing the moms to relax and enjoy the outing themselves. SOFTIN staff and Board of Director members, CALM therapists and the crew of the Stardust went into teach mode, pointing out interesting things about the waterfront, the sea and the critters of the sea and sea shore. The happy group saw seagulls, night herons, brown pelicans, cormorants, egrets, harbor seals and sea lions. 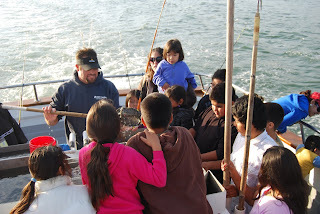 While we were out the kids caught and released a good number of fish, allowing us to teach first-hand lessons about resource management, water quality management and marine debris prevention. We cruised back into the harbor as the sun set. As the smiling kids and appreciative moms disembarked, thanking us profusely, we volunteers were left with a feeling that we really helped some kids gain experiences their lives were lacking and we gave the moms a shared experience they can talk with their kids about to help them through rough times ahead as they try to improve their lives. We helped and it felt great! PS: We at SOFTIN are always looking for more collaborative partners to team up with to serve special-needs people. SOFTIN's website www.softininc.org has a new look and features. Check out the page about our upcoming car show fundraiser at the WWII Air Museum in Camarillo, Ca., and also check out the page on Bentwing, our hero brown pelican. Let us know what you think and how you can help drive our mission. That question about floored me, since the What-up birds are a pair of seagulls who adopted the SOFTIN boat, WaveWalker and visit us every time we come back to harbor. If these kids met our pals the What-up birds, it had to have happened aboard our boat. So I replied, “Yes, the What-up birds are my friends. How do you know those birds? Tiffany rushed over and was immediately swarmed with hugs. The youngsters couldn’t talk and gesticulate fast enough to share their flood of happy memories from their SOFTIN trip with us. At times they talked over each other and at times they talked in unison. Through the whole story telling session they were wide-eyed and excited to relive and share their positive experiences and memories. They had been referred to us by our collaborating partner, Child Abuse Listening and Mediation (CALM). We have done many good works together. These are moments to live for…..
How do we keep this year in perspective? What a wild year for SOFTIN, and just about everyone else! Nonprofits are having a tough time and donations are generally declining. SOFTIN was able to buck that trend. Our revenues increased. The reason? Twofold, really. One is that people who understand the power of the sea… in terms of healing and in terms of being a place where change can happen… have come to SOFTIN’s aid with donations to fuel our program. The second reason is that we have worked very hard at attracting funding. One of our fundraising enterprises was to begin what will be an annual car show. That was a boatload of work, but a truckload of fun. We are anxious for next year’s show (Sunday, July 25th, save the date.) which will be at the WWII Air Museum in the Camarillo Air Field). We’ll have hot rods, classics, low riders, trucks, motorcycles and bicycles, along with vendors and stuff for everyone (kids, too) to do. Thanks to the folks are the WWII Air Museum, there will be vintage war birds mixed in. Can you imagine a WWII fighter plane next to a 1940s classic car? Awesome! SOFTIN’s Board of Directors put in a tremendous amount of volunteer work to provide direction, oversight and just good help. They help drive this boat and thanks to them we are on the right course. For the staff, the most memorable part of the year has been providing services and giving hope to hundreds. We have memories of trips which bring a tear to our eyes every time we think about or talk about those profound heartwarming experiences. We helped people overcome trauma, work through disabilities and impairments. We helped families stay together and learn to have fun family adventures to break cycles of abuse. We are making a mark on this world and it is a wonderful mark. Thank you for sharing the story and I hope you will find ways to help. PS: Our website (www.softininc.org) has buttons for Paypal and credit cards, to make donating easy. Sharing good news makes my fingers quicker on the keyboard and right now I have happy fingertips. Two successive donations have helped SOFTIN to continue to provide services to our special-needs community. $500: I put on a talk about SOFTIN at a meeting of a fishing club. These are boat people who understand the value of lessons learned at sea. After the meeting, a feller (who wishes to remain anonymous) came up to me and asked for my address so that he could send a check because he felt deeply touched by what we do for the disabled, impaired, victims of abuse, frail elderly and youths-at-risk. Two days later his check for $500 arrived in the mail. He lived up to his word and thanks to him, more services can be provided. $1,603: In mid-November SOFTIN was invited to set up an information display for the corporate Charity Fair at FLIR Corporation, a high-tech company. I wrote a blog entry here at the time. We just received a letter from FLIR describing donations from employees, matching amounts from the company and an award from their community philanthropy fund. Along with the letter were checks totaling $1,603. Wow! There are plenty of special-needs people who are going to benefit greatly from this donation. SOFTIN is SO thankful for these two generous donations, especially here at year-end. We get a little misty-eyed about such things. We are, after all, SOFTIN softies and this is the most meaningful work we have ever done. Even in a year of worldwide economic woes SOFTIN has much to be thankful for on this day of Thanksgiving. Our funding level has suffered, yet our level of service grew substantially to our highest level yet. Our collaborations with other nonprofit organizations grow stronger. Our volunteers… from Vivy Vague selling family-made candles and baskets, to Dave Bacon (my son) working on illustrations for the Bentwing Books, to the many hours of loving labor our Board of Directors puts in… remain steadfast and dedicated to our mission of providing at-sea educational adventures to special-needs people. It is a good Thanksgiving! PS: We are planning for next year and I’m glad to have you with us. SOFTIN was invited to an unusual and wonderful event…. A corporate Charity Fair. FLIR Corporation in Goleta, California does this each year. For many years, the company funneled employee contributions and corporate contributions to one of the big national charity organizations. But at the request of a number of their employees who wanted to see their contributions go to helping a variety of nonprofit charitable organizations, FLIR management came up with a bright plan… invite numerous charities (ranging from very small to very large) to set up display tables at a 2-hour Charity Fair in the large and tastefully decorated company break room. FLIR employees came in and talked with all of us, gaining helpful insight on all the wonderful charitable work being done locally, regionally and nationally. The employees even had a fun method of engaging in a raffle, based upon cards on which they gathered signatures from the nonprofit representatives they spoke with. Subsequently, FLIR awards donations to the various attending organizations. The event was a positive and engaging experience for all. I doff my hat in admiration and appreciation to FLIR Corporation and especially to the staff members who worked very hard to create and manage the Charity Fair. We look forward to insurance renewals with some trepidation. Will the costs go up? Will the coverage go down? We are diligently working on coming up with tax-deductible donations to cover our insurance bill, anticipated to be near $1,700. SOFTIN Directors firmly believe in the importance of insurance. We carry liability insurance to protect people and assets. We also carry a Directors and Officers policy to protect our people and or organization. Every nonprofit organization should put good insurance coverage high on the list of financial priorities. It is always best to do things right. As we teach our special-needs passengers about the wonders of the sea, about stewardship of our environment and how to perform tasks aboard a vessel, SOFTIN teachers find our rewards in many of the same feelings as shore side classroom teachers. It is the amazing feeling of taking a pupil from ignorance to understanding on any given topic. The profound feeling of accomplishment felt by the student is perfectly mirrored in the teacher. It is a partnership… an agreement… a bond. On the student’s part, there is an acceptance of a teacher as one to learn from and a commitment to try to learn. On the teacher’s part, there is an acceptance of a void of knowledge to fill, skills to teach and a relationship to foster. When a pupil feels the joy of learning and a sense of accomplishment, the relationship bonds lights up with mutual accomplishment. The teacher is just as joyful as the student. At times, maybe more so. Those are feelings worth living for and seem to be most powerful between special-needs kids and their teachers. Consequently, SOFTIN teachers are happy teachers. PS: SOFTIN teachers are always looking for more special-needs pupils. Contact Capt. Tiffany (805 574-9388) to join in on an educational adventure. A look of self pride comes over anyone who masters a nautical knot or accomplishes some other form of marlinspike seamanship. But when a special-needs person learns well and demonstrates proficiency, the power of that feeling of accomplishment is a tangible and contagious feeling of joy. Teaching ropes and knots and coils and such is one of the most important parts of SOFTIN’s curriculum of on-the-water educational adventures. At times the task is a bowline knot and at other times it may be a proper cleat hitch and flemish coil. No matter the task, marlinspike seamanship skills are something to be proud of and something to be admired. Self respect and a sense of accomplishment are the desired byproducts and it always seems to work. SOFTIN passengers learn may things during the course of an adventure and seamanship lessons/skills have proven repeatedly to be among the most beneficial in terms of personal growth for the people we serve. The heart of SOFTIN is educational adventures for special-needs people. To make the most of an opportunity, the planning stages are vitally important. SOFTIN staff works closely with caregivers from family or collaborating agencies bringing the adventure-seekers to us for an excursion. Some special-needs people have more in the way of special-needs than others. For some, fear of the unknown is a huge obstacle to a rewarding experience and one which requires one-on-one nurturing and comforting throughout the educational adventure. We rely on caregivers to give us the information we need to provide for special-needs and in many cases we rely on caregivers to come along so the passengers can remain within their comfort zone and thereby maximize the benefits of the journey. Other special-needs people just need opportunities to expand their horizons. They are comfortable boarding a vessel, taking instruction and joining in the learning activities. The important thing is to learn about special needs in advance of the trip and prepare accordingly. Once our preparations are complete and we have provided for everyone’s needs, we begin the fun part… Teaching enabling life skills and sense of self esteem to challenged special-needs people (including disabled, impaired, victims of abuse, frail elderly, youths-at-risk) though one-on-one, hands-on educational lessons and experiences at sea; practicing marlinspike seamanship; viewing, identification and monitoring of marine mammals and seabirds; demonstrating subsistence/recreational fishing skills focused on the principles of ethical angling; teaching ocean conservation values and water quality issues; learning about the people, infrastructure, vessel types and job/career opportunities among our waterfront communities; monitoring and educating the public and resource managers about sea life and habitat. PS: We do not charge our special needs passengers. Our work is to benefit them. A generous couple in Santa Barbara… as previously reported here in our blog… has offered to donate a 25’ sailboat complete with a berth (slip) in the Santa Barbara Harbor. SOFTIN is seeking financial support to take possession of this wonderful service resource which we plan to use to provide sailing adventures to deserving people with disabilities, impairments, victims of abuse, frail elderly and youths-at-risk. I estimate the combined value of the sailboat and slip to be $26,000. The first-year costs are estimated to be $15,000. In subsequent years, the costs will drop to a fraction of the first year costs, so the value will still be strongly positive, in terms of dollars and cents. In terms of service to the special-needs people we serve, the continuing value will be… well, priceless. I just had to share this story because it surprised and delighted me. I try to find and follow all regulations and requirements. It takes some doing, considering the myriad requirements of city, county, state and federal government. After much research and sifting through conflicting information, I determined that we should have a sellers permit from the Ca Board of Equalization (BOE) because a very small amount of the income (a whopping $57) from our car show is actually taxable. So I went through the application process and got the durned thing right before the car show. Filing is quarterly, so I’ve been waiting for October to file. Meanwhile, I received two letters from the BOE notifying me that they require a $2,000 security deposit. So I called them up, got to the right person (which was actually easier than I expected) and explained that we have $57 to pay taxes on, meaning that our total tax liability will be about 5 bucks. Therefore a $2,000 security deposit is way out of line and makes it unreasonable for me to comply with the regulations. You can imagine my surprise when the state of California understood my logic, agreed with me and waived the security deposit. They even invited me to call them up when I’m ready to file (about next week) and they will walk me through it the first time. These folks are downright reasonable and sociable! After such a rousing and fun car show fundraiser this year, SOFTIN’s Programs Manager, Capt. Tiffany Vague (tvague@softininc.org) is searching for the perfect venue for our next car show fundraiser. We have the date… Sunday, July 25, 2010, so mark your calendars and please plan to join the fun as a visitor or maybe enter your car. We will have a long list of show categories. Entries can be handled with Capt. Tiffany. The location will probably be in the tri-counties area (Santa Barbara, Ventura or San Luis Obispo counties of California), but we may find a perfect place elsewhere. We expect more cars, more vendors, more fun things for kids to do and fun things for the adults, too. I’m thinking a dance contest might be fun, with music from the 50’s 60’s 70’s, 80’s 90’s and 2k tunes as well. I hope you will be there! Loud cheers and high excitement fill SOFTIN’s boat with joy whenever porpoise or dolphin are spotted during our educational adventures. This month we are spotting porpoise frequently as they lazily and at times playfully cruise along the coast – often just outside the surf zone – looking for their favorite forage fish. These fun and funny critters remind us of the old Flipper show and our special-needs passengers just love them. Excitement runs high when common dolphins move inshore to chase bait fish. These high-energy critters swim fast and jump high, much to the delight of SOFTIN adventurers. The best part is when they gather around the bow of the WaveWalker (SOFTIN’s excursion vessel) and ride along with us. Seals and sea lions are our constant companions around the harbor and we nearly always have a chance to visit them. Sea birds and shore birds are likewise ever-present partners on SOFTIN trips. High adventure and good times await special-needs friends of SOFTIN. Do you know people with disabilities, impairments, and other special needs? Contact SOFTIN to arrange for an educational adventure they will grow from. Capt. Tiffany Vague organizes our trips. She can be contacted at tvague@softininc.org. Seafaring Opportunities For Those In Need (SOFTIN), Inc.
Santa Barbara Yacht Club Women Foundation donated $1,200 to SOFTIN to fund educational adventures for special-needs kids. SOFTIN will work with collaborating organizations to identify recipients, based upon needs assessment or reward system, who will benefit from learning about the waterfront, various vessel types, ocean-related career opportunities, marine mammals, sea and shore birds, marlinspike seamanship, fishing, marine resource management, water quality management, marine debris prevention and the concept of becoming trusted shipmates. The rewards of these educational adventures are profound and meaningful and SOFTIN thanks the Santa Barbara Yacht Club Women for making such adventures possible. A kind and wonderful couple offered to donate their sailboat (a Cal 25’) and slip to SOFTIN. This allows us to add a significant and powerfully therapeutic service to SOFTIN’s program of providing at-sea educational and self-esteem building experiences to special needs people we serve. We are thinking that once a passenger works through our curriculum aboard the WaveWalker (our existing service vessel), this allows an option for continuing education and adventure aboard the sailboat. This concept will provide both an incentive and reward for our passengers and give us the opportunity to help them grow and experience another dimension of adventure at sea, first-hand and hands-on. I can just picture their ear-to-ear grins as they haul on ropes, watch the wind fill the sails and feel the power of nature provide momentum. The challenge facing us (and I hope you will help us with this) is a first year expense of roughly $14,500. Subsequent years will be less costly. The costs of the first year are weighted by slip transfer and other one-time fees. Our deadline for raising the funds is nearly November. SOFTIN has the capacity to establish and maintain collaborative relations with additional organizations which provide services to special-needs people. Our list of collaborators is impressive (YMCA, Parents of Special Education, Child Abuse Listening & Mediation, and others) and we have room for more. We invite and encourage contact from potential collaborators so that we can enrich lives by providing at-sea educational adventures. Please make contacts for us, should you know of someone who works at such an organization. You can make good things happen for some very deserving people. Do you have special needs people in your family or circle of friends? Tell them about us and help them contact us. Contact Capt. Tiffany Vague at tvague@softininc.org, to explore a collaborative relationship or to schedule educational adventures for special-needs people. SOFTIN wants to offer a note of appreciation to Marriott of Ventura Beach for hosting a meeting, yesterday, of our Board of Directors. Allowing us use of a nicely appointed meeting room was a gracious and helpful contribution. The cookies, melon tray, coffee and water were very nice touches. This resort hotel is beautiful and staff members were friendly and helpful to a person. They even checked with us periodically to see if there was anything they could do to make our experience better. We couldn’t have been more pleased. Our BoD meeting was quite productive. We voted in a new slate of Directors and Officers, listened to officer and committee reports, discussed our escalating services to special-needs people, reviewed our social networking plan, our fundraising event and laid plans for future fundraising and community awareness raising events. Finally, we discussed a sailboat and slip that a wonderful donor wants to give to SOFTIN to help us expand our services. Life really is sweet when providing special services to special-needs people.